Si j’ai donné ce titre à ce billet, ce n’est pas que je cède à cette nouvelle ( ?) forme de communication à l’œuvre dans mon environnement professionnel, mais plus pour vous interroger sur ce que vous ressentez lorsque vous recevez un message électronique avec cette introduction, ou que quelqu’un utilise cette formulation lors d’une réunion ? Cela me met instantanément mal à l’aise… Est-ce un mécanisme d’alerte sur la sincérité de l’émetteur ? Dans le Monde daté du 17 avril, Vincent Duclert, Historien, professeur agrégé à l’Ecole des hautes études en sciences sociales, alerte sur un projet de loi adopté au Sénat le 8 janvier, et qui sera soumis au vote des députés le 29 avril. Que cherche-t-on à cacher ? Une mobilisation qui doit aller au-delà pour être entendue ? 2-Et après ? 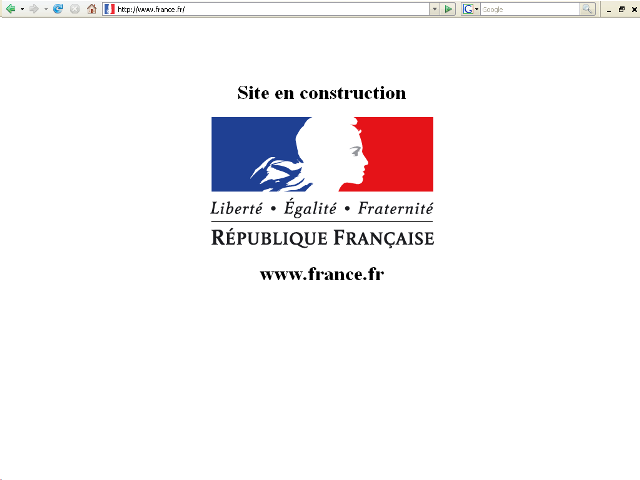 il pourrait au moins y avoir une redirection vers service-public.fr ou vers diplomatie.gouv.fr… non ? La culture ne s’hérite pas, elle se conquiert. C’est la question à laquelle la Commission va devoir répondre ! The SELF Consortium and the Free Knowledge Institute have the pleasure to invite you to spend exciting days of interaction and discussions on one of the most important topics nowadays – education and learning in freedom, in the paradigm of the Information technologies. Educating in Freedom – technological aspects of e-learning; the SELF Platform; training Free Technologies advocates; showcase of educational materials and many more specific topics. As part of the Conference, we are inviting you to witness the awarding ceremony of the « Free Knowledge, Free Technology » Open Documentary Contest. With the objective of promoting Free Software and the sharing of free knowledge, the FKFT 2008 Conference will bring together hundreds of people from different continents including government representatives, school and university teachers, IT companies, publishers, and NGO’s. By gathering together people from all these groups, we aim to stimulate both present and future collaboration between diverse disciplines, sectors and countries, through the medium of free software programs and the sharing of successful experiences related to free software and free technologies. Registration is now open. The deadline for early bird registration has been extended to April 30, 2008. The FKFT 2008 organisers highly recommend that you make reservations for hotels and flights as early as possible as July is high-season period in Barcelona. The Free Knowledge Institute and the SELF Consortium (Internet Society Netherlands, Universitat Oberta de Catalunya, Free Software Foundation Europe, Gothenburg University, Internet Society Bulgaria, Fundacion Via Libre and Tata Institute for Fundamental Research) will collaborate to organise the content of the conference and to build strong relationships between attendees. The conference partners recognise the vital importance of the collaborative creation and sharing of free educational and training materials on Free Software and Open Standards. Our conference host is the Universitat Oberta de Catalunya. The SELF Platform, a collaborative authoring tool inspired by Wikipedia, will play an important role in achieving this goal. SELF is an international project, initially supported by the European Commission, which has developed a platform to encourage the creative cooperation and the sharing of educational materials, paying special attention to Free Software and Open Standards. The SELF Platform is open to the contributions of all those who like to bring their knowledge to it, and share this knowledge without restrictions. Free Software, as opposed to proprietary software, can be copied, studied, modified and redistributed without restrictions. Moreover, Open Standards, and the capacity they offer for exchanging knowledge and sharing information, have become essential because they allow business and administration processes to function in a more flexible, transparent and cost-efficient way. The expansion of Free Software has brought together a continually growing community of developers.